There's a great deal of work going on across the service to look at how we can keep improving what we do and get the best for local children. You can read about some great examples this month which show how our work is making a difference to the lives of looked after children. Tell us about your own examples of good work You can drop me or communications a line or even make a short video on your phone about your work. We're preparing for our monitoring visit from Ofsted in November and reviewing the quality of our case files. I've made a one minute video to explain a bit more about the visit. Thanks as ever for all you're doing. An innovative new fostering service to support children with complex needs started last month. We’re working with St Christopher’s, a voluntary organisation, to deliver a new service which will provide eight placements at a time for children who are not suitable for mainstream fostering and who would otherwise have been placed in residential care. Record numbers of care leavers are heading off to university this month. Thanks to the support and encouragement from teams across Children’s Services - including Route 21, LACES and Participation - 25 care leavers are now at university. They are studying a range of courses including law and airport management. And some of our recent graduates are training to become teachers, accountants and social workers. Congratulations to the Horizon team and Nicholas Jeffreys who have been shortlisted in the prestigious social worker of the year awards. Horizon has been shortlisted in the team of the year award and Nicholas is up for newly qualified social worker of the year. The winners will be announced at an ceremony in London on 25 November. See how teams in Coventry are using Signs of Safety in their work. New resources have been added to the Signs of Safety page including a video from the recent Signs of Safety gathering in Norwich. If you have some examples of your work you'd like to share, just e-mail communications@coventry.gov.uk. On 18 November children and young people up and down the country will be taking part in the 11 Million Takeover day. The day puts children and young people in decision-making positions and encourages organisations and businesses to hear their views. Children gain an insight into the adult world and organisations benefit from a fresh perspective about their work. Got an idea or want your service to be involved? Contact Shelia Bates, Children's Champion, on 024 7683 1432. The Coventry Children’s Social Care Procedures Manual has now been published - http://coventrychildcare.proceduresonline.com/index.html Make sure you keep up to date. The updated improvement plan is now available on our website. Have you renewed your HCPC registration? Social Work HCPC registration renewal opens on the 1 September 2016 and closes on the 30 November 2016. We've held a number of briefings to help prepare social workers for the renewal, facilitated by the Adults Principal Social Worker Andrew Errington. The annual Christmas party for looked after children is currently being organised, and the team are looking for your help. The party is for children who are looked after aged 12 and under. Father Christmas attends the party and provides presents for all the children. However he still needs some more presents and he suggests we ask you kind people of Coventry City Council for donations. Two staff briefing sessions are being held to explain outline proposals for family hubs and libraries. The sessions will offer the opportunity for staff to hear more about the proposals and to share views and ideas about how they are developed. Staff are encouraged to attend. Legal Services have produced a series of videos aimed at helping children’s social workers find out more about court proceedings. The short films star retired family Judge Donald Hamilton who talks with Julie Newman about the practicalities and processes involved when social workers have to appear in Family Court for care proceedings. Last month we briefed about the improvements we’re planning to make to the use of Protocol to enable us to reduce our reliance on paper based processes. On the 19 September a pilot in the North West Cluster and the Referral and Assessment Service started. The pilot included stopping the creation of new orange paper case files across the whole of Children’s Services. All new cases will now no longer have a paper file. The pilot is going well and will be reviewed in the coming weeks. A rollout of the new ways of working will then be planned for the rest of Children’s Services. Service Managers from across services are already engaged in discussions about how the changes can be embedded in their areas. In the meantime if you have any questions please contact Marc Greenwood x4128. Young people are being given the chance to find out what it’s like to live on their own at special workshops with Route 21 and St Basil’s. Twenty five young people have already found out what’s involved in living on their own and what they need to plan and prepare for. From budgeting and paying bills to planning meals and cooking and cleaning, the workshops also help identify any extra support that might be needed. The Coventry Horizon Team helped supported a number of young people in the Youth Participation Group by ‘sleeping out’ in the Cathedral to raise money for St Basil’s Charity. A sleep-out is a sponsored challenged to “rough it” for the night to remind people of the importance of preventing homelessness. 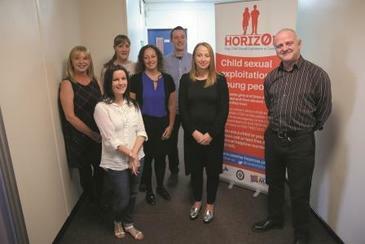 The Coventry Horizon Team work closely with partners to prevent the issues that some of Coventry’s young people face, including homelessness, young people going missing and child sexual exploitation.